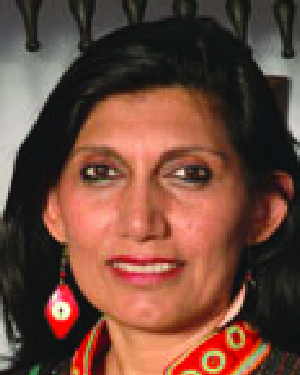 Dr. Fouzia Saeed is an alumna of the College of Education and Human Development and the College of Design. She earned a Bachelor of Science degree in General Home Economics in 1983, a master's degree in Design in 1985, and a doctorate in Education in 1987. As a student she showed innate leadership qualities and was active in the Pakistani Student Association. Dr. Saeed has been fearless in confronting norms that perpetuate the diminution of human rights for all persons and takes action to change those conditions. She has worked extensively on issues of violence against women and its effects on women and children. Dr. Saeed is currently the director and a founding member of Mehergarh, a center for learning, in Pakistan. The center is committed to transforming the lives of future generations. Dr. Saeed is also the managing partner for New Directions, Ltd., a consulting firm on youth, gender, governance, human rights, institutional strengthening, and capacity building of civil society. Early in her career she co-founded Bedari, the first women's organization in Pakistan to address violence against women. She provided leadership to create and pass legislation in Pakistan to prevent sexual harassment of women in the work place. She has held leadership positions as head of the gender unit for the United Nations Development Progamme (UNDP), the national officer for the United Nations Development Fund for Women (UNIFEM/UNDP), and was a coordinator for the fourth World Conference on Women in Beijing, China. She has been a visiting professor in the Philippines and Pakistan and has served as a consultant and adviser on gender and development, community mobilization, and social sector developments. Dr. Saeed is most noted for her book, "Taboo: The Hidden Culture of a Red Light Area." It has been widely acclaimed as a brilliant piece of research that combines activism with scholarship. The book has been translated into several languages and has been recognized in India and Pakistan as a significant contribution to changing the discourse about women. In naming Dr. Saeed as a recipient of the Distinguished Leadership Award for Internationals, the committee cited her leadership accomplishments over the past 24 years that have focused on human rights issues for women and children in developing countries. Her work is courageous, bold, inspiring, creative, and sustained. The committee cited her peers' respect for her work, bravery, and courage, who said she has unusual courage to walk where others do not. At the time of her nomination for the Distinguished Leadership Award for Internationals she was in Afghanistan consulting, lecturing, organizing, and inspiring others. Most of her work is done in countries where feminist causes are not welcome and outright opposed.